Back pain relief is something every hiker has sought at one time or another. As the crow flies, your lovely hiking objective seems so easy, so attainable. Yet after wiping the sweat from your brow and taking off your pack, you're reminded of just how hard you've been working your muscles to get there. As you straighten up and acknowledge your sore back, what are your options for back muscle soreness? Great question, because if you already ache, imagine what delayed onset muscle soreness holds in store for you tomorrow! Back pain prevention tips are covered near the end, after we look at your options for on-the-spot pain relief. No medical advice is being given here, just common sense about your muscles giving you persistent back pain messages. And begging for some back pain relief! A glorious day on the trail. Don't let back pain derail your hiking plans. Let's leave back pain prevention off the table here. If you'd like some fast tips, go here. Or skip down to the bottom. You could always grin and bear it. But if you're not a stoic hiker, what are your other options for back pain relief? Apply topical analgesics like Mineral Ice to mask the pain and allow you to keep hiking. Note that these depend upon a fully stocked first aid kit. Plan ahead, and always replenish what you use. Other strategies to relieve back pain due to carrying a backpack involve behaviors you can implement when the soreness first presents itself. If you have access to snow or cold water, cool down the painful area for at least 20 minutes. As you allow the hydrotherapy to work, sip water and eat a snack. Alternative option: an instant ice pack in your medical kit; activate it and allow the cold to penetrate deeply. or sit against a solid surface to press into the pain for a count of ten. Massage releases endorphins, which can help the brain tune out your pain signals. So even if you're not a massage-y person, it's worth a try! Stretching can be used to let your aching muscles (especially your hamstrings) know they are acknowledged for their hard work but that you won't be antagonizing them any further. At home after a hike, you have a wider array of options to alleviate back pain. It's in your best interest to rule out a serious problem such as a herniated disc or other nerve problem, which needs a completely different approach than sore muscles. Convinced it's a soft tissue problem? All of these methods are aimed at bailing you out of the immediate situation, namely a sore back caused by hiking. you can take preventive action. The first place to start: a hard look at your backpack, and what's in it. If you've never given much thought to how to buy a backpack, here are my thoughts on this important subject. Need some specific tips for fitting a backpack to your body? If you're satisfied that you are wearing the best backpack for your body, and it's adjusted correctly for your torso length and chest dimensions, turn your attention to what's in the pack. In fact, turn the pack upside down, and paw through your pack contents after they hit the floor. Anything fossilized or moldy has got to go. If you haven't touched, let alone used, an item in months, toss it. Heavy or outdated items like antiquated head lamps or cracked water bottles, out they go. The worthy goal here is to lighten up and pay attention to your gear. Only carry what you need, truly need and use, on a hike. 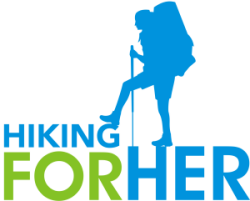 And start to investigate the merits of lightweight hiking gear here. There's no judgement or blame implied. I myself have been known to carry rock specimens for an entire season because I was too lazy to fish them out of the bottom of my pack, compounded by forgetting that I collected them in the first place. So go on a little fishing expedition into the bowels of your pack, and toss the stuff you don't want to be carrying over hill and dale. But consider adding a backpack chair to provide support and comfort while you're eating dinner or relaxing on a lake shore. If your daily routine is to sit at a desk, or stand at a work station, or use only one side of your body to do work, or some other routine that does NOT involve hiking, your muscles adjust to your routine. To say they're a little shocked when you hit the trail might not be an overstatement! So check yourself in a full length mirror when you've wearing your loaded backpack and trail footwear. Do you jut your chin out? Are your hips in alignment with your shoulders, or do they push forward or make your buttocks stand out? Also make it a habit to spot check yourself on the trail, especially if you begin to feel a twinge in your neck, shoulders, back or knees. Ask your hiking companion(s) to give you feedback about your posture, too. Make notes in your trail journal about adjustments you tried, and if it made a difference in your back pain. It might also be time to consider how strong (or not) your core muscles are currently. Daily exercise directed at your abdominal muscles and superficial to deep spinal muscles can bring back pain relief to your hiking plans. Nothing radical! Try these suggestions. Your big muscle groups on the backside of your body work really hard while you hike. Without getting into the long Latin names of these muscles, let's just say that your upper and lower deep back (shoulder and spine area) muscles are overlain with more "shallow" muscle groups. Either the deep, or the superficial, back muscles could be giving you back pain. A quick way to figure this out: press gently on the sore area, if you can reach it. If you can't, place a tennis ball or similar round object on the floor and lower the sore spot onto the ball. If gentle pressure doesn't make you holler OUCH, then keep pressing until you "sink into" the soft muscle tissue. Of course, you are breathing calmly and deeply as you apply this pressure. If you have to apply quite a bit of force to elicit the pain message, you're dealing with an unhappy deep muscle/muscle group. Pain relief is going to require back stretches and probably application of cold and warm compresses and a topical analgesic. Go here to read about the different types of back stretches you can do to get some relief from back pain. Back pain doesn't clear up instantly unless you mask the pain. And all that does is keep you on the back pain merry-go-round, right? Prevention and self awareness are the way to get off that "round and round and round you go" cycle. So apply the back pain relief strategies immediately, and then work on a long term strategy for pain free hiking. 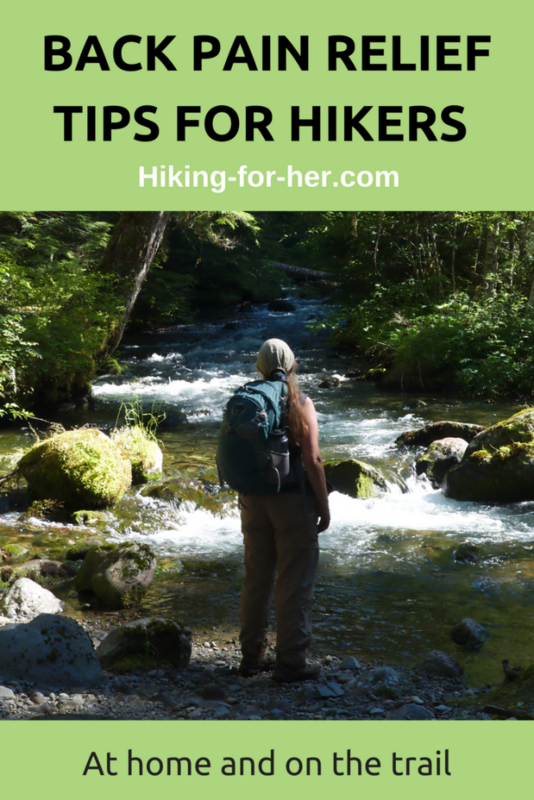 More healthy hiking tips right here!